Helping Hogs Prepare for Hibernation. So what do you need for a long sleep? Body fat reserves - A hog under 600g may not survive the winter hibernation. It is imperative they build up a good fat reserve to keep them healthy through the long cold days of sleep. You can help by providing many of the foods mentioned in the Hog food page. 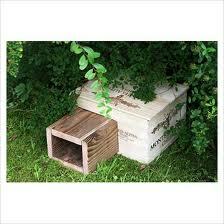 A safe place to sleep - you can buy commercial Hog Houses or make your own. I have provided a template below. 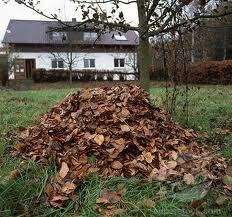 Leave compost heaps, leaf and wood piles alone, you never know who is using them for shelter. Don't let your dog disturb them either. Waking a Hog up may deplete vital food stores and weaken the sleeping Hog, which in turn may greatly lessen his chances of surviving the winter. 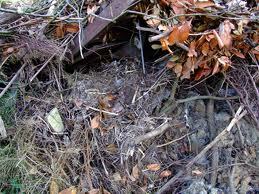 Warm and Dry - Should your garden become flooded carefully check any areas you think there may be a sleeping Hog. 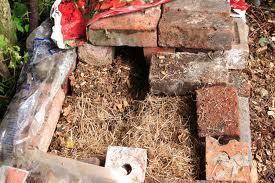 A favorite place is under garden sheds but in very wet weather it gets cold and boggy under there and a sleepy Hog may not be able to dig its way out or may even drown. A Hog home for the winter. 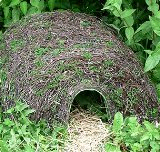 An easily-made Hedgehog Home which can be put in a quiet secluded wild are of the garden and can be covered in twigs and leaves to blend it into the garden. Below are some examples of Hog-made, human-made and shop-bought Hog homes.